We are all spirit by nature; therefore all that we do is spiritual. However, being spiritual is a lifestyle that we create while we experience the physical world. Getting back to nature and being one with all things is spiritual for some, while chanting mantras and meditating several hours a day and being spiritually connected to others is spirituality for others. But the truth is, spirituality is a choice of lifestyle as is being Christian, Buddhist, an atheist or anything else. It is a way of life that includes symbols and rituals that represent a way of life that we imagine as spirituality. When I first started channeling and writing about spirituality and trying to find my own spiritual awareness, I imagined I would be levitating a foot above the ground as I walked down the street. I imagined I would be seeing things others did not, and I would have great intuition and wisdom. People would be drawn to me for advice and clarification of their purpose. Well, some do that, but it is nothing more than that which happens everyday with anyone else. All of us are being spiritual; being somebody. Simplicity seems to be synonymous with being spiritual. Many spiritually aware people choose to live simpler lives, but it does not mean that they are more spiritual than someone with a complicated or busy lifestyle. Spirituality is a lifestyle that we make up. It is a philosophy or direction/path that we choose to experience. It is just another box that we find ourselves in everyday. Because one third of our entire being is spirit, we cannot even choose to be spiritual; it is what we are anyways. So spending our lives trying to be something that we already are can only be a lifestyle choice. In the course of practicing spirituality what we are in fact trying to do is to become more "spiritually aware." We are trying to connect to spirit and its purpose and to be in harmony with that purpose. Knowing what our destiny is and aligning ourselves with it brings greater power and resolve to manifest it in this lifetime. To say that a person is really spiritual implies that they are more spiritual than another. That is not correct. It simply means that one may be more connected with spirit or more "spiritually aware." It is something we all have to wake up to. We are spirit first, having a physical experience. But we did not come here to have a spiritual experience, but to have a physical experience. No one knows what spirit is. Being spirit is different that being spiritual. One is a thing, the other is an experience. It is not possible to define or experience being a thing unless you are that thing. Many people believe that spirituality empowers us to use our psychic abilities, but that is not the case either. There are many people who display psychic abilities who do not live a life of spirituality. Psychic abilities are once again physical attributes because they can be seen, heard, smelled, felt or tasted. They are extensions of what we already do and they can be developed and experienced physically by anyone. The use of psychic abilities does not make us anymore spiritual than we already are. Being spiritual is being the way you are now; being natural. It is more correct to say that I am spirit, being Roy. And it is natural for Roy to say that "I am" being this or that. We live within the illusion of the separation of spirit and Roy, but really it is the spirit saying "I am" Roy. The spirit is really the middleman between mind and body; it is the energy which gives animation to the body. Spirituality is a physical manifestation of our thoughts about what spirit is, and what it does. Nothing can take us to spirit, whether it is religion, faith or spirituality. The only way to get there is to be there, and to know it as absolute. While you are practicing, training or living the lifestyle, you are not there, you are experiencing getting there. For a Christian, Muslim, Jew, Mormon, Buddhist or the spiritually enlightened to say they have found the way is arrogant, and pretentious. If you are on the path - you are not there. As a race of beings, we take ourselves much too seriously. The simplicity of spirit is to be what you already are and not something you are trying to be. In the process of writing this article, I am being spiritual naturally; I am spirit being a writer. I have chosen to live the spiritual lifestyle that I have created, because it gives me a different perspective on my environment. But I am no more spiritual than anyone else. It is simply an expression of how I feel and my thoughts about the physical life and the circumstances that I have created. Writers, philosophers, and artists simply express themselves publicly. Their spiritual inspiration comes from an open connection with spirit and mind, very much like what you are doing every day in your chosen lifestyle. Your inspiration comes from the same place, although you may not physically express it as spirituality. These people's thoughts are manifested through a filter of spirituality, rather than religion, mysticism, fear or something else. Living my chosen lifestyle of spirituality has not excused me from human emotion or physical restrictions. I live in a physical world and I am subject to all things physical. My spiritual insight helps me to see a bigger picture and interact with the environment differently than others. The same can be said for any lifestyle. But none of the things I have chosen in this lifetime can or will prepare me to be a spirit being after death. They are two different realms of existence and one can only experience them while they are one or the other. We are faced with many choices everyday, what we choose will determine a new experience that cannot be experienced the same way in any other time or place. We make these choices most of the time based on our chosen lifestyle. Lifestyles are little boxes that we live in, and they go no where. To fully evolve to the next step, you must choose another box and continue choosing. The very meaning of life is motion, and it is continuous. What you choose tomorrow does not negate your past choices; they are simply sign posts that you have moved on. Every choice is another step in your development. Your old thoughts about whom and what you are represent pieces in a museum. You observe them and marvel at how far you have come. You can see where you have been and were you are going. You do not go to a museum to condemn the past but to marvel at it. Spirituality is a choice and a lifestyle; not an end unto itself. What you are now and how you have chosen to express it is a signpost or landmark for you and others. However, you are not here to learn anything but to experience all that it has to offer. When you have matured enough in your belief you will move on despite you own best efforts not to. But don't look back at it as a mistake or a wasted life. Try to remember that it has brought you to this point and you are ready to experience something else. From my perspective it would appear that humanity has stalled in its own spiritual development. Nothing much about human spirituality has changed since time began. That observation comes from a place in time and space that does not see the whole picture. It is a limited physical judgment. It is because humanity is already spiritual and there is nothing to change; it is why he does not see it. He does not have to find what he already is. His only purpose here is to experience all things physical, he is a "spiritual being," experiencing physical life, and this is not a school where he has to learn anything. He is simply experiencing his thoughts about what it is to be physical in his own unique way. Spirit, spiritual, and spirituality are not the same things. However, they are connected through the physical experience and our own thoughts about what they are. While you are here, seek to better your life. Know that it is you who is creating all the circumstances of your life and that only you have the power to change it. Get out of any box that is not working for you and move on. Become away of your spirit and your destiny and your life will be filled with abundance. Life will be less of a struggle and filled with anticipation and happiness. Never allow anyone to lead you down the garden path by suggesting that they know the way or that their way is the only way. No one can ever know your way or your destiny and purpose. Where ever or whatever you are now is appropriate for you at this time and space. When you discover that it is no longer working for you, you will change your circumstances or you will remain and experience complaining about it. There is no right or wrong way to express yourself; there is just your way. Your circumstances will always demonstrate physically what you are thinking about yourself and your relationship to others and your environment. You are the creator, just look around you and see how your environment fits into you belief system. Look at the people, places and things that surround you. This is spirit, your spirit in physical form; your manifestation. Do you like what you see, does it bring you peace, good health, abundance and fulfillment. If not, why not and what are you waiting for. Who do you think is going to change it for you? There is no person or thing that is greater or has more power than you to change your life. Be what you are naturally. Be the grandest version of the greatest vision you will ever have about who and what you are or not! About the author - Roy E. Klienwachter is a resident of British Columbia, Canada. A International published author, a student of NLP, New Age Light Worker, Teacher and Phenomenologist. Roy's books and articles are thought provoking, and designed to empower your imagination, and take you to places you would never have thought of. 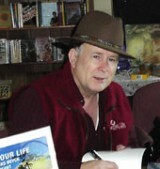 Read about Roy's books at: www.selfgrowth.com/experts/roy_e_klienwachter.html.